Here's the latest comic for Investing.com. 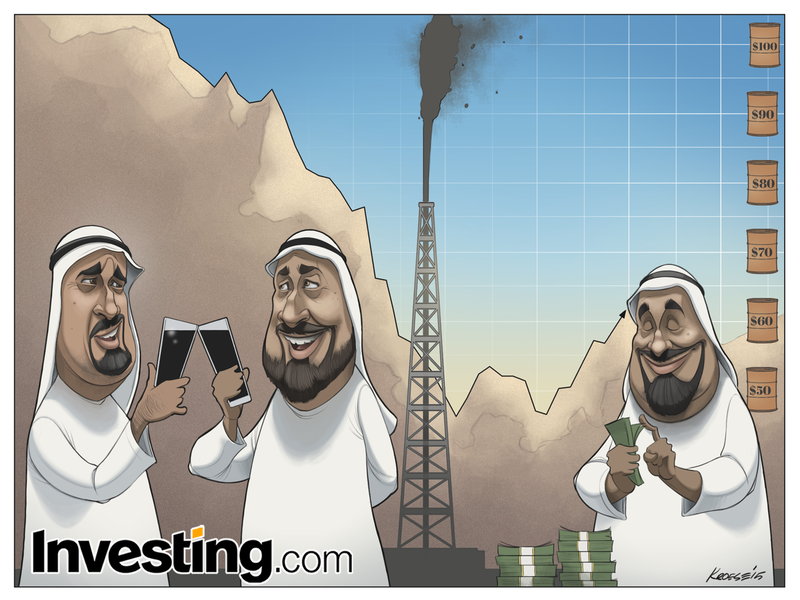 This week's subject is the possible rebound of oil prices after a pronounced and prolonged softening of the market. 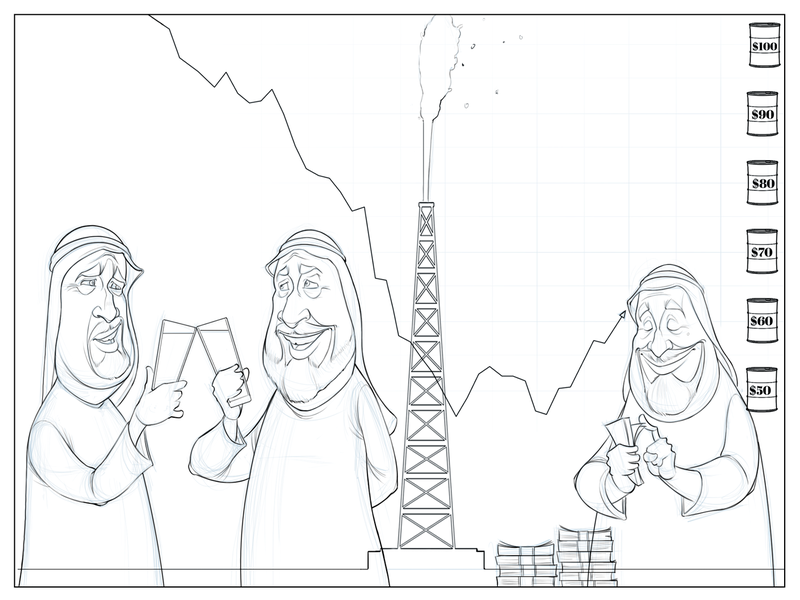 The good folks at Investing.com asked me to draw three sheikhs. The first two were to be raising glasses of oil and the third was to be counting money. In the background, I was asked to include a graph depicting the last several months' worth of oil prices that included the dramatic drop and recent rebound. They also asked me to include an oil well gushing oil. 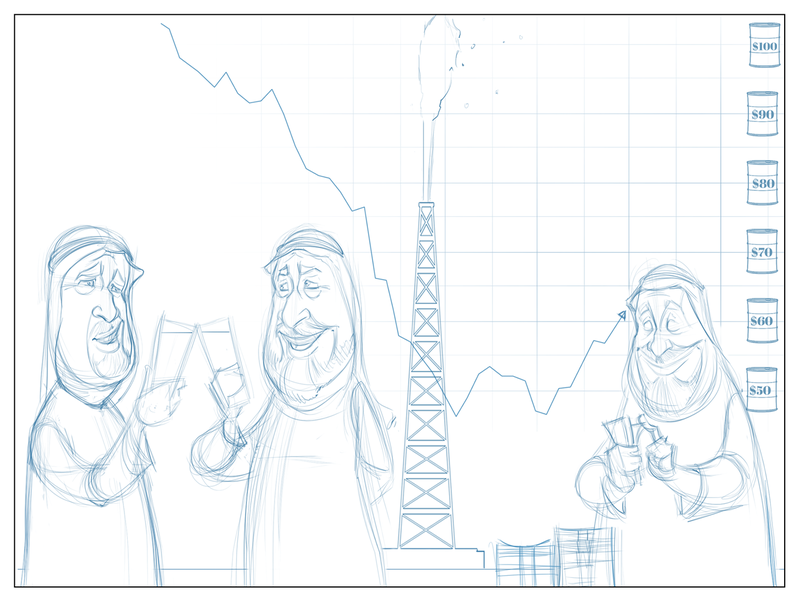 Composition-wise, I tried a couple of different layouts at first, including one with the oil rig to the far left. But that arranged all the elements of the comic from tallest to shortest, left to right. It didn't look right for some reason, so I placed the rig in the center to break up the line a bit. Instead of using standard numbers indicating price per barrel of oil on the graph, I decided to add cartoony barrels of oil with the prices on them. Mostly to add a bit of visual interest and to try something a little different. Otherwise, everything else was fairly straightforward. After being disappointed with the way last week's comic turned out, I was determined that this comic would be better. As a result, I probably spent a little more time on the layout than I would have ordinarily. But I think the extra time was worth it. Incidentally, I took another look at last week's comic. I don't think it's the WORST comic I've ever done, but I can see multiple areas where I could have done better. This week's comic is far more cohesive-feeling.